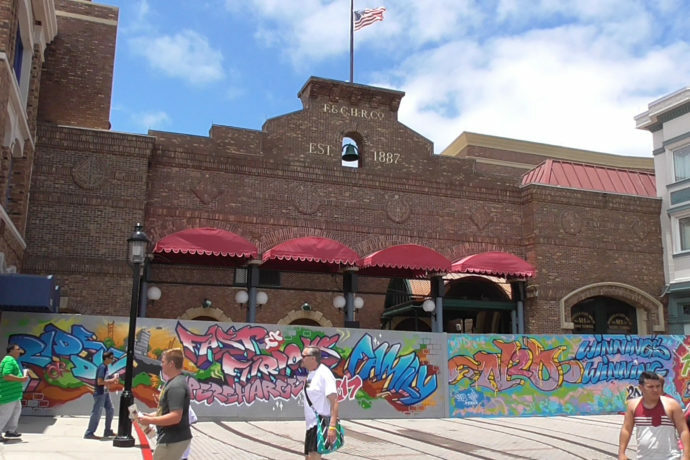 It’s time to take a look around Universal Studios Florida and see how some of the big construction projects are doing and what’s new in the park! As soon as I got there I noticed a lot of new merchandise added to the main studio store for the upcoming film The Secret Life of Pets. There have been rumors of this property getting its own ride in the parks if the film is a success, (and I have a feeling the film will do just fine). One of the mugs caught my attention as it’s actually branded with ‘Universal Studios’ on it! Over at Race Through New York Starring Jimmy Fallon lots of work continues at a breakneck pace as facades get built, roofing gets laid, walls go up, and lots of interior work gets done. It looks like another rounded (screen-like) wall on the inside is being constructed too. See images below for more details. Not much is happening at Fast & Furious Supercharged. They took down the potted plants in front of the work walls. That’s about it. And finally in City Walk, Toothsome Chocolate Emporium (formerly ‘Chocolate Factory’) is coming together nicely with new brickwork on the front. 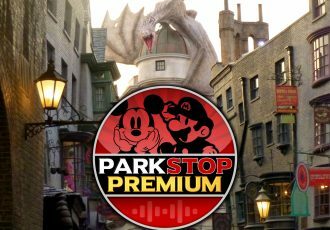 See the video along with lots of images with more information about these projects below and stay tuned for more theme park updates! Look at me. Look at me. I’m the alpha now. Buying wall decals at a theme park? Sure, why not? Many believe these stairs will be temporary, but maybe they will be used for team members after ride opens? These were the last to be updated and now they really pop! Not much going on near former Disaster entrance, however the potted plants in front of walls have now been removed. Strange. Wonder why they were placed there in the first place. No change at the former Disaster exit… Oh, and, Amity Island lives on! That’s all for this update! Check out some of our previous updates for Kong and Hulk!